Our referee will bring everything you'll need to play knockerball to you. They will set it all up, run the games, and break everything down when you're done. All you'll need to do is show up & play! Each Package Rental Includes: certified industrial grade Knockerballs (6, 8, 10, 12, or more), 1-2 referees to run the games, a soccer ball (add a giant inflatable soccer ball for $25), field cones, and 2 goals. Rent a "Play Time" for 1, 2, 3, or more hours. 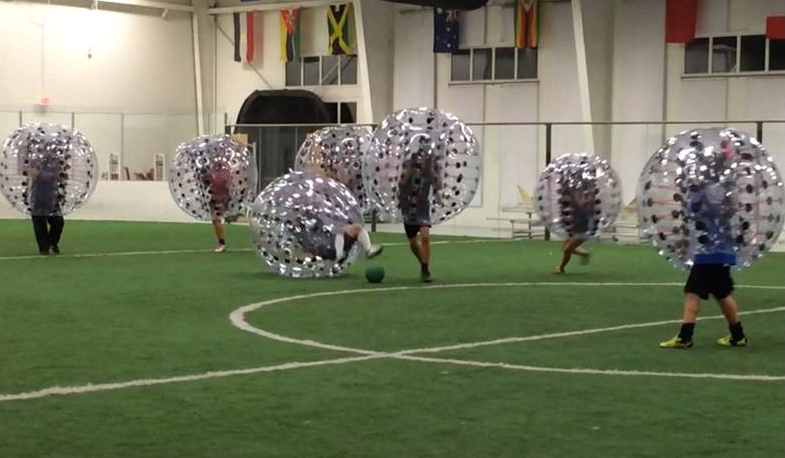 We can also recommend a few good places to play knockerball-bubble soccer near you. We travel all over the Tampa Bay Area including St. Petersburg, Clearwater, Pinellas, Tarpon, Hillsborough, Land O Lakes, Sarasota, & more. 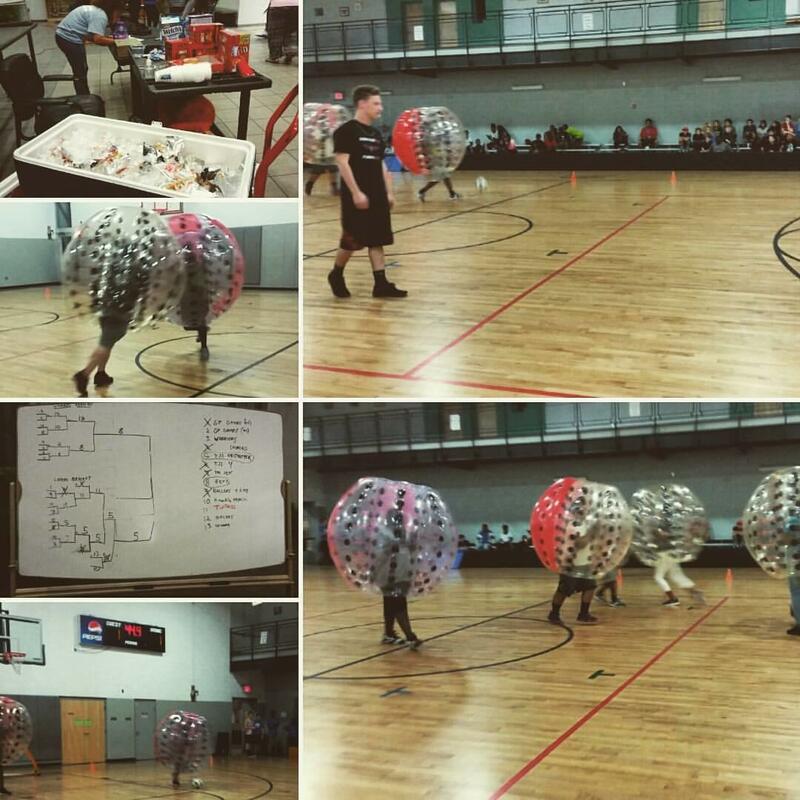 Get more information about setting up a Knockerball party. How many balls do you need, where can you play, what is the cost? Play inside or outside. We travel all over the Tampa Bay Area & more. Knocker Soccer, Sharks & Minos, Gymnastics (Flips & Rolls), Sumo, tournament style, and more. Be a kid again & book a Knockerball Party for your birthday! Adults love to play knockerball. Get a group of your friends together and knock into each other, do front flips, and laugh so hard your sides hurt. This is a great activity for adults who like to play sports and laugh with their friends. Had a great time with Mandi and Kyle! We had a group of 12 friends in our late 20s and early 30s [we don't want to grow up]. They were both very easy going and helpful throughout the whole process. Knockerball is definitely a really fun and active sport that everyone should try. My adventure crew had a BLAST! First time playing the sport and the addition of nature and RAIN made it that much more exciting. Great fun for family and friends! We are already scheduling our next Knockerball session! GREAT INVENTION!!! Knockerball is great for Team Building- Play Knockerball Games like Secret Service and work as a team to keep your president alive to win. Get a group of co-workers together, pick a location to play (inside or outside), and we'll travel to you. Check out Locations you can play. Book your private bachelor/bachelorette party today & have everyone talking about how much fun they had knocking each other around. We can book the location for you & your friends, all you need to do is show up ready to Get In The Ball, and have a blast! Game play is typically 1-2 hours. That is plenty of time to play during the day, then go home and shower before you hit the town for your night activities.